Jan (Jordan ’70) Hailey, former Greek instructor at Abilene Christian University, died Nov. 2, in Eden Prairie, Minnesota. She was 69. Funeral services are planned for Monday at 11 a.m. at Abilene’s University Church of Christ. The family will welcome guests at a visitation today from 3:30-5 p.m. at Piersall Funeral Directors (733 Butternut, Abilene, Texas 79602). Jan was born March 7, 1948, in Sweetwater, Texas, to John Randolph Jordan (’45) and Marilee (Faver ’43) Jordan. The family moved to Abilene and Jan attended public and private schools there, graduating from Abilene Christian High School in 1966 as valedictorian. While a student at ACHS she wrote the lyrics of the school song that is still used today. 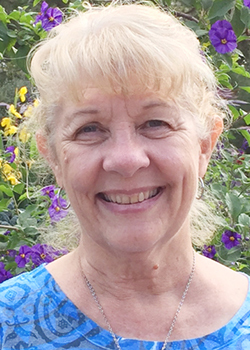 She attended ACU where she met Mel Hailey (’70), a military brat hailing briefly from Tennessee, while the two were working in the bus ministry at Highland Church of Christ. They married March 29, 1969, a year before Jan earned a Bachelor of Science in Education degree. She taught eighth-grade English in the Frenship (Texas) ISD for a year while Mel attended graduate school at Texas Tech University, then stayed home while her children were young. Beginning in 1988, Jan worked 11 years as a research assistant for Dr. Paul Faulkner (’52), professor and founding director of the Marriage and Family Institute at ACU. Faulkner honored Jan in the acknowledgements of his book Raising Faithful Kids in a Fast-Paced World. During those years she also completed a master’s degree in Greek in 1995 and began teaching. She was honored in 1997-98 as the part-time teacher of the year in the College of Biblical Studies, and eventually joined the Bible faculty full time to teach freshman and sophomore level Greek, Message of the Old Testament, and Christianity and Culture. She completed a Master of Divinity degree in 2003 and retired in 2008. During and even after her years in the classroom Jan often received letters from ministers asking questions about New Testament Greek translations, and she always responded. For two years after retiring she worked at University Church of Christ as the church secretary. Jan was in demand as a speaker for women’s retreats, frequently speaking about prayer or on prison ministry, which became a passion. For several years she taught women in the Taylor County Jail, often continuing to work with women after their release. She was appointed by Judge Lee Hamilton to the Taylor County Jail Planning Commission and honored for her service. She also was on the founding board of Abilene Habitat for Humanity and in many other ways committed herself to “the least of these.” She volunteered for Noah Project and Meals on Wheels and was a member of the Emmaus Community frequently serving as chaplain on Women’s Walks to Emmaus. For most of her life she was a member of University Church of Christ, serving on many committees. Jan was “Nonnie” to her and Mel’s six grandchildren who adored her because she would get down on the floor to play at their level. She loved attending their recitals and plays and prayed for them by name every day. She also loved adventure, especially hiking. She hiked across England, through Ireland and much of the Oregon coast. Jan is survived by her husband, Dr. Mel Hailey, and by her two children and their families: Jennifer (’94) and Joel (’95) Nichols, and their children Benjamin and Natalie Nichols of Eden Prairie, Minnesota; and Robert (’97) and Jill (Abbott) Hailey and their children Joseph Zrinyi, and Ryder, Caitlin and Caroline Hailey of Dallas. She is also survived by her sister, Vicki Ruth (Jordan ’73) Shepard of Plano. Those wishing to honor Jan’s life may make a memorial gift to Christian Homes and Family Services, 1202 Estates Drive, Abilene, Texas, 79602, or to Abilene Habitat for Humanity, 101 Fulwiler Road, Abilene, Texas 79603. Mel, I am so sad to hear of Jan’s death. I loved her teaching in the 80s in a women’s class at University Church. I also appreciated the aerobics classes she led for years; they started me on a lifetime of exercise. I love the picture you chose; her joy and kindness emanate from it. Mel, our thoughts and prayers are with you. Mel, I remember all the fun Rob and I had being AHS tennis parents with you and Jan in the 90’s. I am so sorry. Sending love and prayers to you and yours, Sarah. Mel, I’m so sorry to hear this. I loved Jan. She and I worked together on several things and sort of prided ourselves by breaking through and getting our training in the GST and then getting to teach. She of course surpassed me in her work in academics. She was so kind and concerned about others. I’m so sorry for your loss.